We are developing a national capacity to train the next generation of state and federal agency scientists in taxonomic identification of harmful marine algae, helping to rebuild and maintain expertise critical to managing the impacts of harmful algal blooms in every U.S. coastal region. Many harmful algal bloom (HAB) research and monitoring programs rely heavily on trained experts who can recognize often subtle, morphological characteristics of HAB species and quantify cell abundances in water samples via microscopy. Cell counts are often used as an early warning of potentially harmful blooms and a trained taxonomist with a light microscope continues to be a critical and cost-effective early warning and monitoring tool. As the “gold standard” of HAB species identification methods, specialists trained in these methods are also needed to help other researchers verify results from new technologies being developed to facilitate automated HAB cell identification in areas with diverse HABs or with emerging HAB problems. Training the next generation of U.S. HAB managers, scientists, and technicians in HAB taxonomy is widely recognized as a core national infrastructure need by NOAA, Congress, and the HAB community. These skills are critical for the continued success of early warning monitoring programs that protect state shellfish growing areas, which are recommended by the Interstate Shellfish Sanitation Conference (the administrative body of the National Shellfish Sanitation Program). The current generation of U.S.HAB taxonomic experts is at or beyond retirement age and reliance on ad hoc and generalist training programs has led to a lack of national preparedness in this area. NCCOS funding will help develop, convene, and sustain a professional HAB identification training program for the United States. 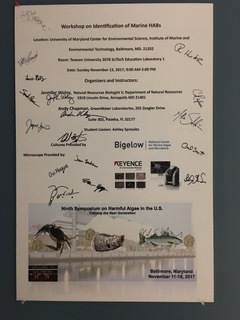 The program will be located at the Bigelow Laboratory for Ocean Sciences in East Boothbay, Maine, and will capitalize on resources and expertise housed at the Provasoli-Guillard National Center for Marine Algae and Microbiota (NCMA). The course will provide expert, certified training in marine harmful algal taxonomy using a combination of lectures and hands-on exercises, and will have an intensive Web-based component to expand the utility of the course. The project will establish detailed course material for an annual taxonomy class to be hosted at the Bigelow Laboratory through the NCMA for three years. It will also develop an implementation plan that will facilitate the transition to a self-supporting annual or biannual class hosted by the NCMA. These certified training courses will benefit and target local, state, and federal government workers involved in all aspects of HAB management and research. Prior to the formal meeting, two day workshops are planned on identification of freshwater (Saturday) and marine (Sunday) HAB species. In parallel, two day workshops in identification and quantification of marine (Saturday) and freshwater toxins (Sunday) will also be held. A workshop on molecular identification (Saturday) and PAM Fluorometry (Sunday) are also being offered. 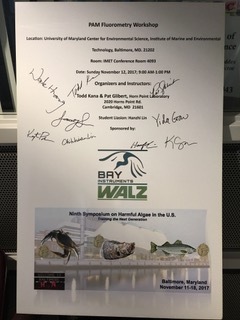 Andrew Chapman (GreenWater Laboratories) & Jennifer Wolny (Maryland Department of Natural Resources) will conduct a one-day workshop on the identification of freshwater HAB species (Saturday) and a one-day workshop on the identification of marine HAB species (Sunday) prior to the Ninth Symposium on Harmful Algae in the US. The workshops are intended for those who use microscopy-based methods in their HAB monitoring programs. Participants should have a basic understanding of light microscopy. 1. Lecture on basic algal cell morphology for cyanobacteria, dinoflagellate, flagellate and diatom groups. Participants are encouraged to bring samples from their research areas to examine during the workshop. Workshop is limited to 12 participants. A waiting list will be established to fill openings should there be cancellations. Jonathan Deeds (FDA) & Juliette Smith (Virginia Institute of Marine Science), along with several guest lecturers, will conduct a one-day workshop on the Saturday prior to the Ninth Symposium on Harmful Algae in the US on the detection of marine biotoxins. The workshop is intended for students, researchers, and managers interested in learning about current techniques for the detection of marine biotoxins. Some previous knowledge of marine biotoxins is preferable but not required. Basic laboratory skills are required. Freshwater biotoxins will not be covered in this workshop but will be covered as part of a companion workshop to be held on Sunday. 1. Lectures covering a brief background on the major groups of regulated marine biotoxins in the US (PSP, ASP, NSP, DSP, AZP, and CFP). 2. Lectures on the main categories of analytical methodology currently available for the detection and quantification of the marine biotoxin groups listed above including, in-vivo, in-vitro, analytical recognition assays (ELISAs, SPR, etc. ), and chemical confirmatory analysis (HPLC, LC-MS/MS, etc.). 3. Hands-on training for representative detection methods for select toxin groups [Note: due to time restrictions, not all toxins and methods will be covered with hands-on training]. Wayne Litaker (NOAA) & Kathryn Coyne (University of Delaware) will conduct a one-day workshop on the Sunday prior to the Ninth Symposium on Harmful Algae in the US. The workshop is intended for managers and researchers with previous PCR experience. 2. Lecture and discussion on controls, common problems encountered in running samples and potential solutions, standardization among labs, etc. 5. Open session where people are free to run their own samples or use provided reagents supplied by the instructors. Results will be analyzed. Jennifer Wolny (Maryland Department of Natural Resources) & Andrew Chapman (GreenWater Laboratories) will conduct a one-day workshop on the identification of marine HAB species (Saturday) and a one-day workshop on the identification of marine HAB species (Sunday) prior to the Ninth Symposium on Harmful Algae in the US. Todd R. Miller (UWM) & Greg Boyer (Suny-ESF), along with several guest lecturers, will conduct a one-day workshop on the Sunday prior to the Ninth Symposium on Harmful Algae in the US on the detection of freshwater biotoxins. The workshop is intended for students, researchers, and managers interested in learning about current techniques for the detection of freshwater biotoxins. Some previous knowledge of freshwater biotoxins is preferable but not required. Basic laboratory skills are required. Marine biotoxins will not be covered in this workshop but will be covered as part of a companion workshop to be held on Saturday. 1. Lectures covering a brief background on the major groups of freshwater biotoxins in the US (cyclic peptides, alkaloids, amino acids). 2. Lectures on the main categories of analytical methodology currently available for the detection and quantification of the freshwater biotoxin groups listed above including, in-vivo, in-vitro, analytical recognition assays (ELISAs, SPR, etc. ), and chemical confirmatory analysis (HPLC, LC-MS/MS, etc.). Lisa Campbell (Texas A&M University) & Heidi Sosik (Woods Hole Oceanographic Institution) will direct a 1-day workshop that will take place on the Sunday prior to the Ninth Symposium on Harmful Algae in the US. This one-day workshop is intended for current users of the Imaging FlowCytobot who have IFCB data. We encourage participants to bring data sets with them to the meeting for hands-on practice. Principles and applications of PAM fluorometry for measuring photosynthesis will be discussed in the context of microalgal studies. This workshop will focus on demystifying the phenomenon of variable fluorescence and its relationship to photosynthetic activity. We will demonstrate the use of a multicolor instrument for separating photosynthesis from major groups of algae in mixed assemblages. Emphasis will also be placed on how this instrument, the newest in the PAM fluorometer line, can be applied toward studies of mixotrophy in harmful algae. Workshop is limited to 10 participants. A waiting list will be established to fill openings should there be cancellations. This workshop is scheduled to run 3-4 hours.